Lake Monticello is located in Fairfield County off of HWY 215 in Jenkinsville, SC, adjacent to the Broad River about 35 minutes from Downtown Columbia. It was completed in 1978 as a pumped storage facility run by SCE&G (South Carolina Electric and Gas) and provides cooling water for a single unit nuclear reactor. It complements the existing Parr Reservoir which was built in the early 1900’s and together these are the two main components of the pumped storage Fairfield Hydro Station and the V.C. Sumner Nuclear Station. An adjacent 300-acre "Recreational Lake" was later built as a public recreational area. The non-traditional hydroelectric station at Lake Monticello uses the adjacent nuclear power facility to pump water into the reservoir, and then releases it through the turbines to produce power. During this process the water levels rise and fall, sometimes causing 5-foot fluctuations in the water level of Lake Monticello. Boaters must take extreme caution and be alert of any hazards that may arise during this time. In comparison to Lake Wateree and Lake Murray, Lake Monticello has some heavy restrictions on fishing and boating and allows no water-skiing or jet skis. Additionally, SCE&G owns a strip around the entire lake so that they can maintain the natural beauty and prohibit excavation projects. The SC DNR manages the lake for recreational fishing and maintains 1 fish attractor site. Popular sport fish on Lake Monticello include catfish species such as blues, channels, & whites and yellow and flat bullhead catfish species. Other popular game fish include largemouth bass, black & white crappies, white bass, and bream species such as bluegill, redear, & redbreast. 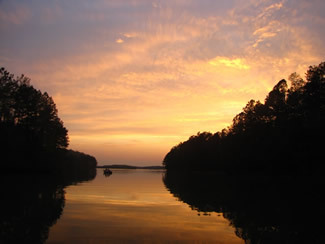 Historically, the SC DNR has monitored these species with such activities as largemouth bass spring electrofishing, littoral rotenone sampling for LMB & Lepomis spp., trap net sampling for crappies, cove rotenone sampling, a fisherman’s creel survey, and meter net sampling for threadfin/gizzard shad.